Texan Girl Talks: Just some goals and what not. Goals always sounded better to me than resolutions. I actually really don't like the word resolution because most of the time, they are forgotten and buried two months in. I want to work toward something to make me better. I would encourage anyone to do this. Last year, I only completed 16 out of 27 goals, but I'm going to chalk this up to a win, because of all the craziness in my life this last year with school. I still strived to make my crazy, neurotic, emotional self better. 1. Complete 500 miles of cardio: This is a slight variation of last year's goal of 1000 miles. Yes, major fail, but I really feel that this is something I feel like I can accomplish. 2. Get involved in the community/volunteering. There is no better way to get to know a community than getting involved. That is exactly what I did in Charleston, when I first moved here with the Cystic Fibrosis Foundation, it was to finish an internship for my degree, but nevertheless it was amazing. 3. Write in the blog every week. This won't be difficult one. I love talking to you guys! 4. Drive up Highway 1/Pacific coast Hwy to North Cali. I can't wait. I want to travel as much as I possibly can. 5. Step my feet in the Pacific Ocean. I have never been to the west coast. Before coming to Charleston I had never come to the East Coast. I'm really excited to experience how different they both are. 6. Visit 3 National forest in Cali. One very big one will be the Redwood forest. 7. Eat at 5 local hot spots in Cali- Yes. I will be one of those annoying tourists for awhile, but I'm hoping to experience Cali like a local. After all most of the best spots are almost always hidden and overlooked. 8. Visit Napa Valley. Wine. That's pretty much what you just read. I have no shame. 9. Visit the Last Bookstore in LA. 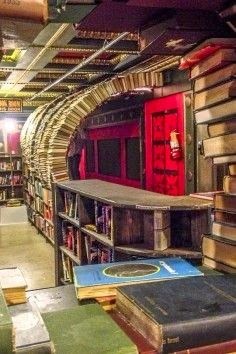 This is one of THE coolest bookstores i've seen on Pinterest. I have to go. I love reading, only you'd never know it with the mounds of nursing materials that have consumed my life the last few years. #struggle. 10. Go to a live audience show. I can't wait. I want to go to an Ellen show, She is hilarious. 11. Pass my NCLEX. My goodness you will hear about the completion of this goal the day I know I pass. 12. Get a job as an RN. Two of my friends have already gotten job offers. I feel a little behind, but I pray everyday Los Angeles has the perfect job waiting for me. 13. Go swimming near a water fall. This seems a little weird, but then again i'm pretty weird. I just want to feel like a mermaid, ok? 14. Read 10 books! Real freaking books, with an ending not involving antibiotics or consistent wound care. 15. Start a BSN program. Yes, continuing my education.. not just so I don't have to start paying back my monstrous mound of student loans. It's a win, win, right?! 16. Be good to my body by staying active and doing yoga. I'm getting older and while I love a good Netflix binge, I can't just wear yoga pants around the house and expect that be a good enough step towards health. 18. Visit the walk of fame. I want nothing more than to be able to take a picture with Audrey Hepburn's star. 19. Run a half marathon. This is absolutely ambitious of me, but I will have some free time to work on my running. 20. Drink a beer on/near the Santa Monica Pier watching the sunset. Y'all know my love for mexican food. There is a mexican food restaurant on the pier and it's calling my name. 21. Watch a California sunrise. This won't be hard. #nightshiftproblems Yes, I'm already foreshadowing that I will have a night shift job. 22. Start learning spanish. Growing up in Texas, I used a lot more spanish, than I actually gave myself credit for, it might have been Tex-Mex Spanish, but I still understood the jest. I want to learn to speak correct Spanish. 23. Run a 9.5 minute mile. Look, Ashley is trying to be ambitious again. Maybe, this can happen. I did run the 10.5 minute mile. 24. Visit pier 39. This pier is in North Cali. Can I even start calling it Cali since i don't live there yet? Oh well, this pier has SEALS. LIKE ACTUAL SEALS. I love animals, not just cats (shocker), but all kinds, and I LOVE seeing animals in their own habitat. 25. Visit the Food truck event on First Friday in Venice, CA. OMG. I want to be healthy, but I want to eat all the good foods at the food trucks too. That is being to your body too, right? and supporting local business.. Win, Win. 26. Be more expressive with my blog. I actually haven't told a good amount of people about this blog, because I feel very protective about my thoughts and feelings and I just wanted to be the blog that everyone stumbles across for some reason or another. I hope to be more confident in telling everyone about it. 27. Create more. Food. Art. everything. I hope to start doing. What I mean by doing is being creative and embracing all my ideas, whether it be creating ridiculous, hideous art/paintings/odd shaped pottery, or creating a recipe with kale and chocolate chips (and I don't even like kale, I know, how un-bougie of me). 28. Trying the Asian restaurants that look questionable and eating something other than shrimp. No one really knows this about me, but, I have a strange phobia that all asian restaurants use nutria, instead of chicken and beef. I only eat shrimp, because I know what shrimp looks like. How irrational, but I know Los angeles has a very large Asian community with all kinds of different culture, and I'm excited to try to experience all of it. I have a lot i'm working on, but I'm very excited to tackle it. I'm even more excited to see what this year will bring, I know moving to the West Coast will be amazing. Do you have any resolutions, ahem, goals for 2015? Anybody have any other suggestions for Los angeles/California bucket list things?! I miss you toooo, Kaaaaaaattttieeeee.